Behaviors such as the munchies, fertility and where you left your car keys all relate to a messenger molecule named anandamide. This molecule contributes to messages in the brain regarding to pain, depression, appetite, memory and fertility. 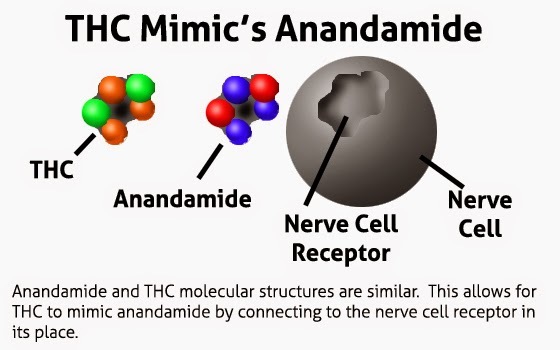 The molecular structure of THC is very similar to anandamide. The similarity allows it mimic functions that this messenger molecule does. Anandamide breaks down very quickly not allowing humans to get to a “natural high”. THC takes more time to break down giving a psycho-active high. What is 2-AG and Does it Relate to Cannabis?